OK, let's get this out of the way first. Comfort food is not always NC (nutritionally correct). The function of comfort food is contained in its name. Put your Euell Gibbons/Michael Pollan hysteria on hold and allow yourself to be comforted by food whose only reason for being is to make you feel better while eating it. Quintessential comfort foods are as much about soothing the psyche as filling the belly. Meat loaf, tomato soup, hot dogs, glazed doughnuts, mac 'n cheese, chocolate chip cookies, fried chicken, corn on the cob (dripping with butter, of course), apple pie ... the list goes on. Let comfort foods transport you to that time and place when life was perfect for you. Maybe not for daily consumption, but allow yourself now and then. Let's sum it up in two words: It works. Enter the gloriously greasy and unabashed delight that is the Grilled Cheese Sandwich. Bread and cheese combinations are as old as the proverbial hills and known across most continents and cultures. Early recipes can be found in ancient Roman cookbooks. 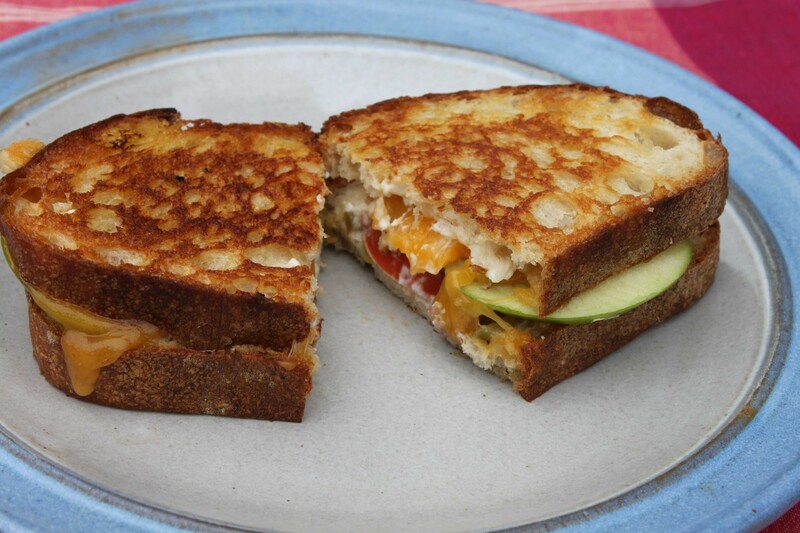 Modern grilled cheese sandwiches owe homage to these recipes. Some sources place the introduction of the classic American GCS in the 1920s, when white bread and processed cheese were affordable. It was a time when tightening your belt was more than a metaphor. The sandwich was economical, easy to make, met government nutrition standards and (if done right) was quite tasty. Made with these basic ingredients, the GCS was sometimes called a "cheese dream," and was an inexpensive option for feeding friends and family at Sunday supper. Sliced tomatoes, ham and bacon could be added, and the sandwiches were often accompanied by olives and pickles. A 1932 San Jose News story, "Cheese Dream New Favorite Sandwich," suggested sprinkling the cheese "very sparingly" with a bit of dry mustard, cayenne, "and a little minced red sweet pepper." The sandwich was browned on both sides and served with "very hot, rich tomato sauce." The sandwiches may predate the Depression, however, as a 1918 Good Housekeeping issue mentions cheese dreams as a luncheon dish, "our teahouse friend." In the 1940s and '50s these sandwiches were sometimes open-faced and made with prepackaged cheese (think Velveeta). It wasn't long before school cafeterias and other institutional kitchens followed suit. Cheese dreams were advertised in 1957 as a 55-cent luncheonette special in the Sunday News Journal in Daytona Beach, Fla. In 1960, the Milwaukee Journal Sentinel recommended preparing cheese dreams in the oven with scrambled eggs and ham. By this time the top piece of bread became standard. The reason is not clear. Possibly this was the least expensive way to make a popular sandwich more filling. In a Milwaukee Journal Sentinel article, Marty Meitus tell us "the grilled cheese sandwich has made a comeback in various incarnations in the 1990s and 2000s. It was estimated in 2001 that Americans consume around 2.2 billion grilled cheese sandwiches yearly, and chefs have experimented with different types of bread and cheese in updates of the classic cheese dream of yore. Pumpernickel, dark brown, and rye breads have been used, topped with Swiss cheese, Gouda, and Havarti respectively. Other options include apples with mozzarella, peaches with edam, and pear with gorgonzola or brie; Italian herbs, sundried tomatoes and mozzarella; with turkey and ham a variation on a Monte Cristo can also be created." Some people wonder about the difference between toasted cheese and grilled cheese. Are they the same thing? On the surface, recipes for both produce somewhat similar results. A survey of American cookbooks reveals that recipes for "toasted cheese" sandwiches predate those titled "grilled cheese." Grilled cheese shows up in print in the 1960s. But it is also apparent that most recipes for toasted cheese sandwiches were broiled (the English use the term "grill" for broiling). To further complicate matters, there seems to be little or no relationship between the name of the dish and the instructed method of cookery. Heating methods include toasting in a broiler, baking in an oven and grilling on a cooktop with a frying pan, griddle or similar device. Regardless of its beginnings, the grilled cheese sandwich remains a cornerstone of the comfort food foundation. Then there's the combination of two comfort foods: Grilled cheese sandwiches were often accompanied by bowls of tomato soup. Go ahead, long for the days when we were blissfully ignorant of ingredients, and excess sodium was not an issue. It's curious that so few restaurants have this delectable treat on their menu, or that some relegate it to the "kids" menu. Is it too lowbrow for our upscale dining-out palates? The next time you're at your favorite eatery, ask them to make you one. See what happens. In the meantime you can make your own. Google "grilled cheese sandwich recipes" and you'll get a google of recipe variations. Assemble, butter one side, grill. Butter the other side while frying, flip at the right time.